Join us for traditional High Holiday Services blended with contemporary messages and insights and welcoming enviroment. Hebrew - English Prayer Books Provided. 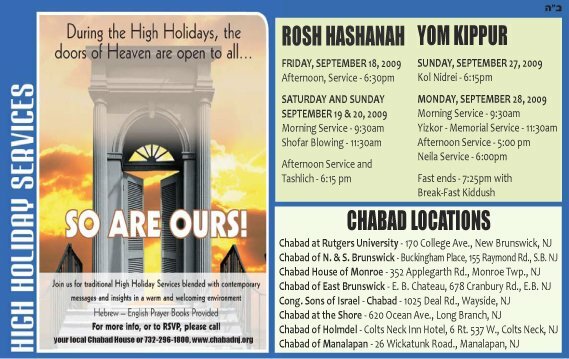 For more info, or to RSVP, please call your local Chabad House, or 732-269-1800. SATURDAY AND SUNDAY, SEPTEMBER 19 & 20, 2009 - Afternoon, Service - 6:30pm - Morning Service - 9:30am. Shofar Blowing - 11:30am. Afternoon Service and Tashlich - 6:15 pm.